If you’re an environmentally concious shopper you probably already have your canvas bags at the ready. On a light shopping you will turn down the offer of having your three objects put into three separate double bags. Kiwis create 735,000 tons of waste packaging a year, and we only recycle 53% of that. There is a solution though, and it’s just opened up in Ponsonby by eco-warrior James Denton. Called GoodFor, it’s the first of its kind in New Zealand. An organic, bulk wholefoods and household items refillery that uses zero packaging. What you get is a store full of bins and jars, looking like a cross between a bulk bin aisle and a victorian candy store. What you can’t scoop, you can get on tap. Founder James Denton’s vision was to create a plastic-free shopping experience to allow customers and their families to fill their pantries without all the wasteful packaging that comes with it. GoodFor will stock organic bulk wholefoods, ecoconscious household cleaning products and beverages on tap. Store etiquette is to bring your own reusable jars and bags to be filled, weighed, paid and taken home ready for storage and repeat use. If you forget your own refillable jars it’s no problem at all, GoodFor also has their own range of un-branded jars to help you transition to a package-less pantry. 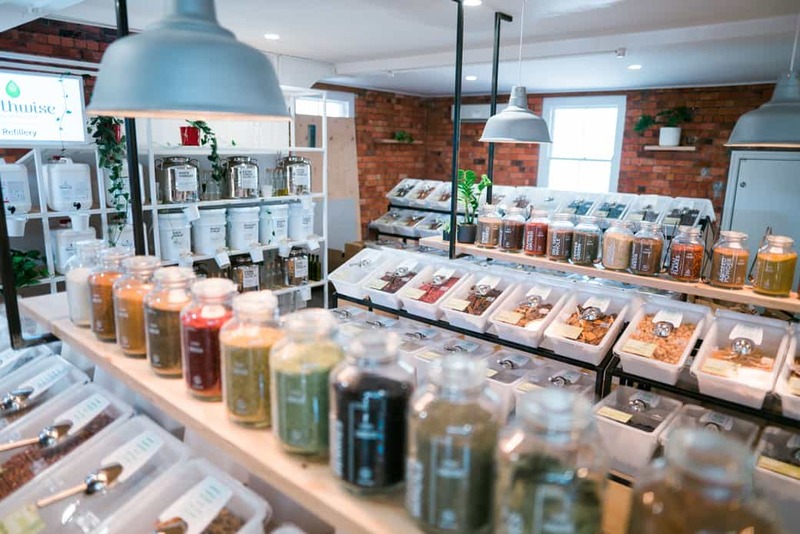 Brands you can expect to find at the refillery include Earthwise cleaning products, things from our friends Little Bird Organics, and Banjo Brews Kombucha from Nelson. Also, how’s this for a delicious idea, from April you’ll be able to fill your own jar with real Fix & Fogg Peanut butter ON TAP. Peanut butter from a tap! Come on! That’s awesome. From April they will also stock a range of GoodFor organic cotton shopping bags and reusable bag kits, beautifully handcrafted in the Himalayas. And for those with a healthy sweet tooth, you’ll be able to stock up on the GoodFor refillable Manuka Honey. If their ecoconscious shopping experience doesn’t make you sick outright they’ve also paired up with teamed up with Trees for the Future. For every purchase made in store, one tree will be planted. You can see more about them on their website.